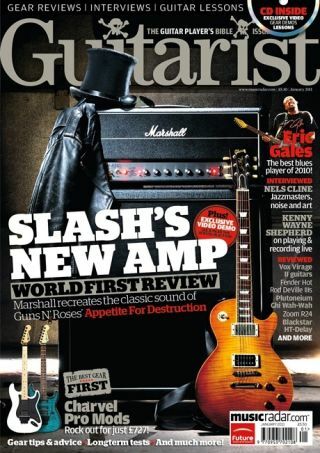 The world exclusive review and a video demo of the Marshall Slash Signature AFD100 head that recreates the classic tone of Guns N' Roses' Appetite For Destruction. Find out why our jaws dropped. Our blues player of 2010 talks about his long road to get here. Gales' new album Relentless showcases an exceptional player - one who's found redemption as a musician after incarceration and substance issues. A dazzling soulful technician but this left-handed player wth upside-down guitar is certainly no Hendrix clone. Fastback is also a landmark guitar punching well above it's £599 weight. Wilco's Jazzmasterer talks about his remarkable new double solo album. The blues-rock Strat fanatic explores traditional blues for his first live album. He tells all about that plus Fenders and fast cars with us. The beginning of the legend's golden years chronicled. The Killswitch Engage man wrote a whole album from his hospital bed when facing a potentially career-ending back injury. Adam tells how this dark time led to a whole new prjoect and album - his finest metal for years with Times Of Grace. Exclusive video demo of the Marshall AFD100 Slash Signature, demo of the Shecter PT Fastback, Fender Hot Rod Deville 410 III and Blackstar HD-Delay, plus more audio and video gear demos and guitar lessons, with tab in the mag - learn rock, blues, acoustic, beginner, shred and a ton of great licks!